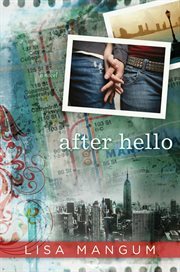 The item After hello, Lisa Mangum, (ebook) represents a specific, individual, material embodiment of a distinct intellectual or artistic creation found in Charlotte Mecklenburg Library. What if the first day of your relationship was the only day you had? Seventeen-year-old Sara is a seeker. She's always on the lookout for the perfect moment to capture with her ever-present camera, especially on her first trip to New York City. Sam is a finder. He has a knack for finding what other people can't, whether it's a first-edition book or the last two tickets to a sold-out Broadway show. In New York, there is always something interesting to find. When Sam and Sara cross paths, neither one of them is prepared for what they will find out about each other, and about themselves. Forming an unlikely partnership in search of an elusive work of art, they're racing against time to set things right for everyone. Did fate bring their talents together for a reason, or will this one day be both a hello and a good-bye?